This is the Tim Bacon “Zone Model” for squash tactics that we will be focusing on this month. Acknowledgements to Princeton’s Bob Callahan and Gail Ramsay for allowing me to implement the model at their camps and helping with the details, and most recently to William Smith’s Chip Fishback for his wonderful graphic of the model! Every week will feature all four types of training with a minimum of 1.5 hrs. drills and playing and about 30 min. of physical/mental training of-court between 7 and 9 pm. Free play following the training where Tim will roam, answer questions and give feedback. – How to get your body ready for squash – the EXOS system: movement prep\. – Zone tactics – learn to choose the right shots from the front-, mid- and back-court. – how to regenerate after play to minimize soreness – how to use the rollers and tennis balls. – Alternate zone games & drills: front, mid-, back-court. Here are some front court game/drill links. Play out point after prescribed conditions performed. 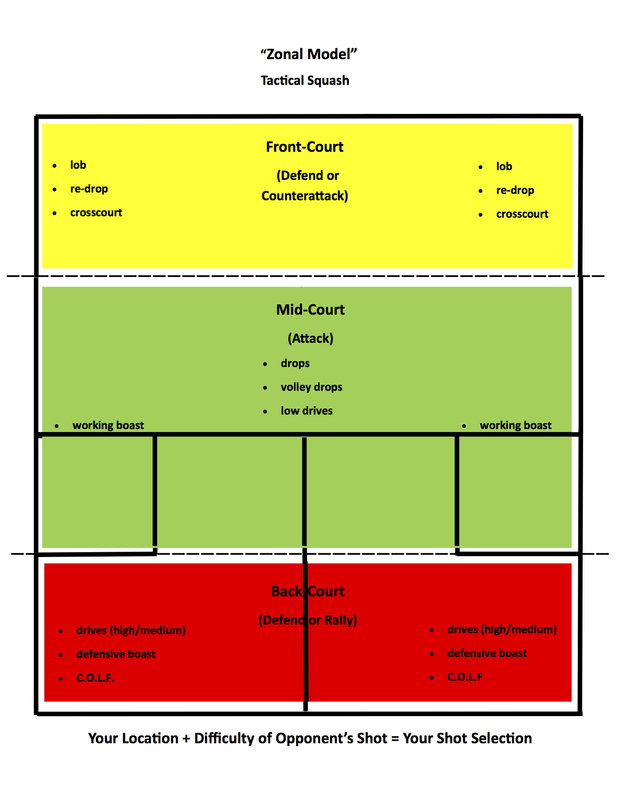 Back – A serves deep and straight from front T – B cannot volley – play out pt. (so B drives, def boasts or COLFs). 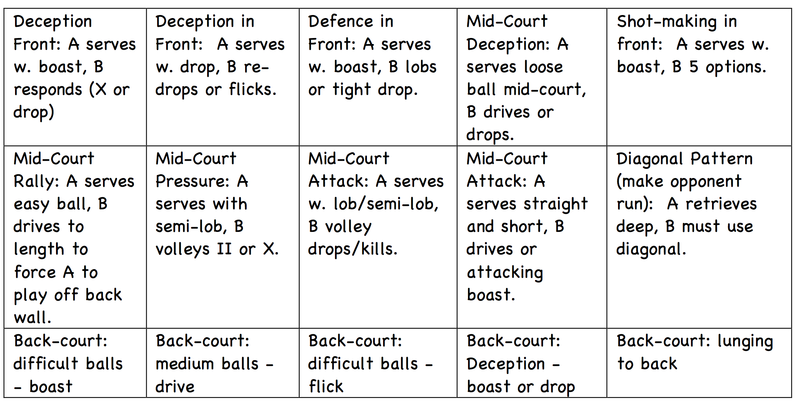 Mid (volleying) – A serves a) a lob or semi-lob straight & short (first bounce before short line) or b) X and loose (cannot hit side wall) – B volleys straight: i) volley drive (to dying length) or ii) volley drop or kill. A boasts, B a) drops low, hard 3-wall def. boast – if B drops – A must REDROP and then play out point. b) drives 2-wall working boast or high def. boast (if you have time to drop – DON’T!!!). Serve/Return Rituals (explain once front game 1 underway). IPS Focus Plan Lecture (brief – refer to vid). – Stroke or let? Two simple models to guide your decisions! The cost of the four clinics is $100/person when payment is received (full refund if cancellation received 7 days prior to first clinic) by Sept. 1. (credit card, check, Venmo, Paypal). The cost after Sept. 1 for the four or to just drop in and show up on a weekly basis is $30 per evening cash only. Email Tim at tbacon@smith.edu to register and call him at 1-413-330-8222 with any questions.